Once the Add On has been downloaded you can install it using the standard WordPress method. 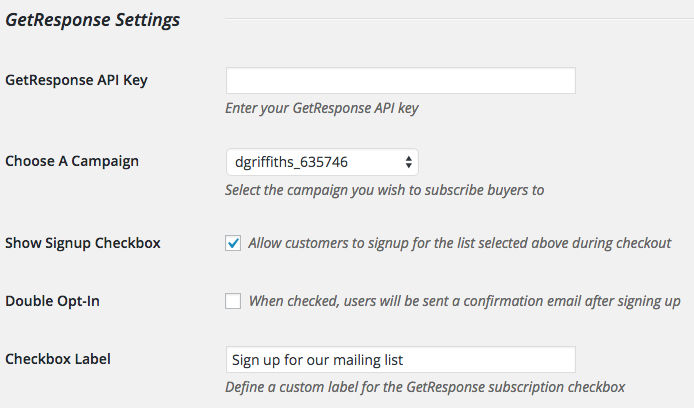 Enter your GetResponse API key. This must be obtained from the GetResponse website. Select whether or not to display the opt-in checkbox. Select whether or not to require double opt-in. Setup the label for the opt-in checkbox. Once you have entered the API key, press save. 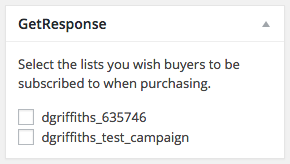 This will load a list of your available GetResponse campaigns into the dropdown labeled "Choose a Campaign". Select the campaign you want users to be subscribed to, and you're done! If you wish to use a specific campaign (or campaigns) for a given download, simply select it! What happens if I leave "Double Opt-In" unchecked? If Double Opt-In is not enabled, you need special permission from GetResponse to have that work. Otherwise, a double-opt-in email will still be sent to the customer requesting that they opt-in. If you want this to happen automatically, without needing the double opt-in email, contact GetResponse and ask them to approve your account for this purpose. Will customers be automatically subscribed if I don't show the option to subscribe upon checkout? No. If you don't check the checkbox for the option called "Show Signup Checkbox" they will not be automatically subscribed upon checkout.